ROYAL CANIN Sensible 33 Dry Adult Cat Food is both nutritious and delicious! Some cats’ digestive systems can be sensitive to certain types of food, if this is the case for your cat then a change in its diet may be required in order to settle its stomach. There are many nutrients that are likely to have a soothing effect on your cat’s digestive system. Suitable for adult cats aged 1-7 years, ROYAL CANIN® Sensible 33 is specially formulated to support adult cats showing signs of sensitivity to certain food. It contains an exclusive combination of nutrients to strengthen and support optimal digestive security. 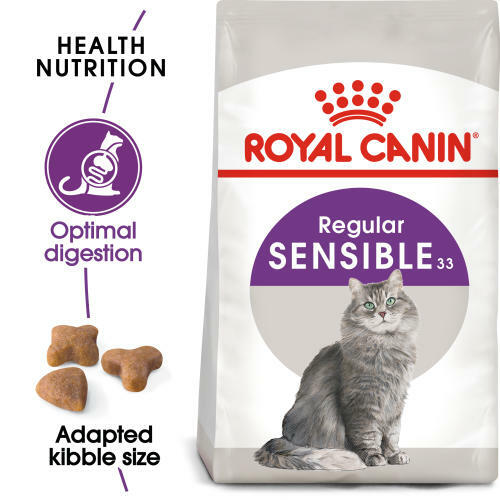 ROYAL CANIN Sensible 33 is highly palatable and contains three different kibble shapes and carefully selected flavourings to stimulate food intake and allow for easier digestion. What’s more, ROYAL CANIN® Sensible 33 has also been formulated to help maintain a healthy urinary system in adult cats like yours. Once your cat’s digestive system begins to improve, you can continue to feed it ROYAL CANIN Sensible 33, as it’s been specifically designed to not only support your cat’s digestion, but to also maintain it thereafter. Optimal digestion - Some cats have digestive sensitivity leading to soft stools. SENSIBLE 33 contains an exclusive combination of nutrients to support optimal digestive security (L.I.P. *) and prebiotics for a balanced intestinal flora. *L.I.P. : protein selected for its very high digestibility. High palatability - Three different kibble shapes and carefully selected flavourings to stimulate food intake in sensitive cats. Concentrated energy - For cats requiring a higher energy density. Additives: Vitamin A: 18500 IU, Vitamin D3: 1000 IU, E1 (Iron): 38 mg, E2 (Iodine): 3.8 mg, E4 (Copper): 12 mg, E5 (Manganese): 50 mg, E6 (Zinc): 150 mg, E8 (Selenium): 0.1 mg - Technological additives: Clinoptilolite of sedimentary origin: 5 g - Zootechnical additives: Ammonium chloride: 5 g - Preservatives - Antioxidants. *L.I.P. : protein selected for its very high assimilation. Composition: Dehydrated poultry protein, rice, animal fats, maize, vegetable protein isolate*, dehydrated pork protein, wheat flour, wheat, hydrolysed animal proteins, maize gluten, yeasts and parts thereof, beet pulp, minerals, fish oil, vegetable fibres, soya oil, fructo-oligo-saccharides. Crude ash: 7.4%. Crude fibre: 1.6%. Crude oil fats: 22%. Moisture: 0%. Protein: 33%.